iGoogle gets a showcase fully loaded with celebrity listing of iGoogle homepages. It has celebrity from different fields of interest and you are bound to find one of your favorite celebrity there. Along with celebrity description, you get option to grab respective iGoogle homepage and flaunt similar on your iGoogle homepage. Besides the full iGoogle homepage cloning, there is optional selective copy-cat feature. Click through any celebrity name on iGoogle Showcase and scroll down to see list of gadgets being used by that specific celebrity on his/her iGoogle homepage. You can selectively add them to your iGoogle homepage. 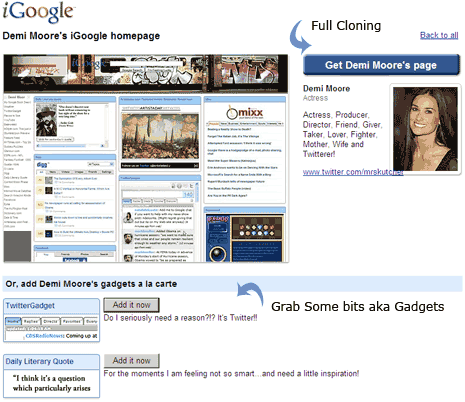 Bump into iGoogle showcase [via] to add some celebrity glitz gadgets to your iGoogle homepage!